Zachary Baer joined Copperhead Environmental Consulting, Inc. as a field technician in the spring of 2012 and became a full time biologist in 2015. Mr. Baer received his A.S. in Wildlife Technology as well as a B.S. in Wildlife and Fisheries Science at The Pennsylvania State University. He has been involved in field surveys since 2009, conducting surveys for small and large mammals, birds, reptiles, amphibians, and gastropods. Since 2010, his main area of focus has been bat species of the eastern United States. Mr. Baer has worked extensively with the federally listed Indiana, gray, northern long-eared and Virginia big-eared bats for both the private and public sectors. He has acted as field supervisor during large projects involving mist-netting and subsequent radio-telemetry tracking of bats. 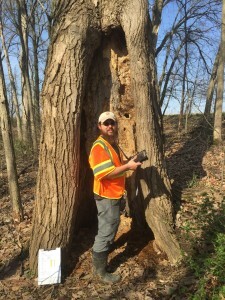 Mr. Baer has also participated in Kentucky Department of Fish and Wildlife Resources annual winter hibernacula counts and has conducted or assisted in counts in over 20 Kentucky caves. He is proficient in many aspects of bat research including mist-netting, harp trapping, acoustic monitoring, radio-telemetry, habitat assessments, exit counts and cave surveys. Mr. Baer also serves as point of contact for BrandenBarkTM, Copperhead’s artificial bark mitigation/habitat enhancement tool. He has been involved with BrandenBarkTM development and product testing and has served as field supervisor during installation and monitoring projects. He has also provided developmental guidance to clientele mitigation/habitat enhancement projects. In his spare time Mr. Baer enjoys traveling, collecting antiques, and working on craft projects.